Eating poorly and carrying excess weight increases your risk of many serious illnesses and diseases and shortens your lifespan robbing you of many vibrant healthy years. It lowers the quality of your life, physically, mentally and emotionally. But, diets are not the long-term answer. In fact, it has been proven over and over that 95% of all diets fail. Diets simply entice us with promises of quick, easy weight loss. Because diets in general are so restrictive, all they do is set you up for failure from the start. Many are so low in caloric intake that you won’t have energy to continue with them for more than a few weeks. It is far better to develop a healthy eating plan – one that you can follow for the rest of your life than to pin your hopes on a short term diet than will never provide long-term results. Another problem with “diets” is that although they most often produce quick weight loss at the outset, they cause serious issues with your metabolism (your body’s engine) and cause it to slow to a crawl. How in the heck do you plan on burning calories and taking weight off if your “weight-loss engine” is crawling? You need to understand that when you skip a meal or go on a crash diet your metabolism slows to conserve your energy. Your body will also feel threatened after a few days and then the “brakes go on” because your body is fooled into believing it is starving and must go into survival mode. It fights to conserve your fat stores and the weight loss you experience is likely due to the elimination of water. The result is you must eat less and less in order to keep losing weight. Not a healthy situation physically or mentally. You’ll eventually become discouraged and give up and fall back into your old eating habits. In truth, you do not need to sign up for a commercial diet program (designed for temporary use), purchase special foods or dietary supplements. Neither do you need to use diet pills in order to succeed with weight loss. The very best thing you can do for yourself is to start eating healthy right now and continue to do so for the rest of your life. The journey to weight loss and better health and longevity is not a “one big event.” It is made up of hundreds of small steps, each one contributing something towards your success. Every healthy meal you enjoy or workout you perform is like a deposit into your health account. All these accumulated deposits add up to a healthy balance that continues to grow. One step at a time…meal by meal and workout by workout is the way to go. Simply begin replacing your not-so-good habits and not-so-good food with better habits and better food. The reality is, weight-loss has to be a long-term solution for it to work. There is no short-term solution. One of the first things you need to do when beginning a weight loss journey is to detoxify your body. Toxins can damage your organs, glands and cause increased inflammation in your body. They are also behind many headaches and generally make you feel “unwell.” But the worst thing of all is that they cause weight gain…the exact opposite of what you are trying to achieve. Eat plenty of fresh natural whole foods provided by Mother Nature herself. Avoid any processed or refined sugary foods and try to drink plenty of clean water daily – skip the fruit juices and soda. Eat clean. This means you minimize the amount of ingested foods that contain toxins such as preservatives, pesticides (always wash your fresh produce), antibiotics, and heavy metals (such as mercury found in some species of fish). 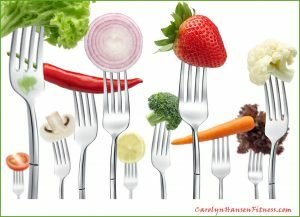 Choose unprocessed organic fruits and veggies along with grass fed organic meats when possible. Start the journey strong and continue strong. Burn more fuel (calories) than you consume. Eat ‘clean’ at least 80 percent of the time. Eat 5-7 small meals each day every 2-3 hours. Make the time to prepare those meals the night before. Take food with you wherever you go so there is no excuse for not eating the right thing. Eat quality protein at each of your meals. Create meals containing 300 – 400 calories. When you have these fundamentals firmly in place in your life at least 80 percent of the time you will not have an excess body fat problem. It will be long gone! Your health will improve as well as your quality of life. All my products address a whole body approach that supports both the body and the mind. If you are serious about achieving a truly healthy lifestyle, one of youth and vitality – “Reclaim Your Longevity” was created for you. It will absolutely help you in every area of your life to stay as young, healthy and vibrant as possible, squeezing every ounce of life out of every minute of your life! Thank you for these helpful weight loss steps. I do workout and eat few processed foods, but, do not lose weight.